10 Ride ESTA Bus Punch Pass is valid for Antelope Valley – (Coleville, Topaz, Walker, Holbrook Junction) Area Dial-A-Ride. Local pickup available Monday-Thursday between 8am-4pm for Antelope Valley pass: Walker ESTA Office 399 Mule Deer Rd. Questions? Call 530-402-6832. 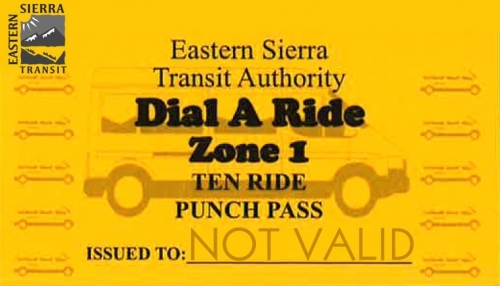 10 Ride ESTA Bus Punch Pass is valid for Antelope Valley – Walker Area Dial-A-Ride.